The title of Chapter 1 is "One of These Nights." The song plays on the radio as Karen drives to her summer job at Rye Playland on the book's opening page. She describes it as her "current favorite" song, in part because of its lyrics, which talk of demons and desires. What teenager doesn't know about those? 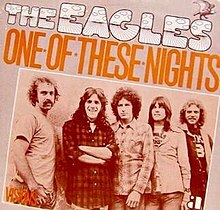 One of These Nights, released in 1975, was the Eagles' fourth album, and most successful to date. But its 4 million sales were quickly eclipsed by two Eagles releases the following year: Hotel California (16 million copies) and their first greatest hits collection (29 million copies). You could say the band was on the cusp of its commercial peak. "One of These Nights" hit the Billboard Top 40 chart in June 1975, going to number 1 later that summer. It was their second number 1 hit, after "Best of My Love" the year before.